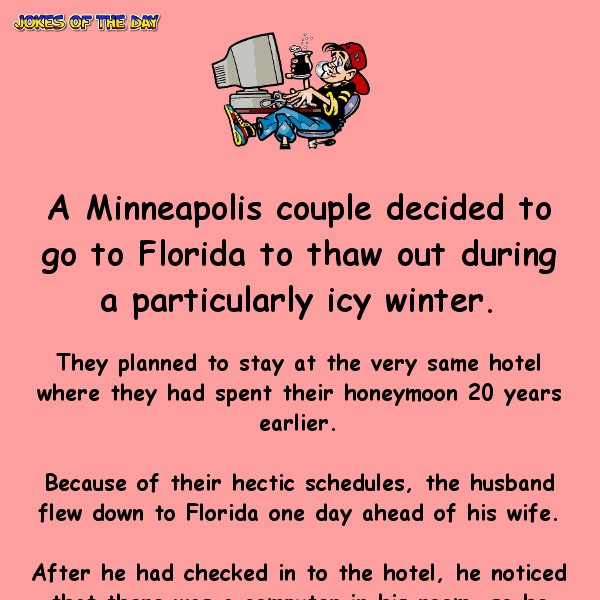 A Minneapolis couple decided to go to Florida to thaw out during a particularly icy winter. They planned to stay at the very same hotel where they had spent their honeymoon 20 years earlier. Because of their hectic schedules, the husband flew down to Florida one day ahead of his wife. After he had checked in to the hotel, he noticed that there was a computer in his room, so he decided to send an e-mail to his wife. However, he accidentally left out one letter in her e-mail address, and without realizing his error, sent the e-mail. Meanwhile, somewhere in Houston, a widow had just returned home from her husband’s funeral. He was a minister who passed away after having a heart attack. The widow decided to check her e-mail since she was expecting messages from relatives and friends. Subject: I’ve Arrived! I know you’re surprised to hear from me. They have computers here now and you are allowed to send e-mails to your loved ones. I’ve just arrived and have checked in. Everything has been prepared for your arrival tomorrow. Looking forward to seeing you then! I hope your journey is as uneventful as mine was. PS. Sure is hot down here.